In 1978, Mr. Contreras graduated from McAlester High School (7th in a class of 282). In 1982, Mr. Contreras graduated, with Honors, from University of East Central Oklahoma State with a B.S. in Business Finance. In 1985, Mr. Contreras obtained his Juris Doctor, with Distinction, from the University of Oklahoma School of Law. 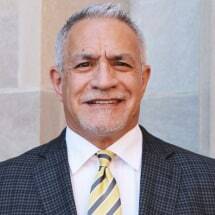 While in law school, Mr. Contreras earned the honor of membership in the Oklahoma Law Review, the University of Oklahoma law school's legal publication. Mr. Contreras took and passed the State Bar Exam that summer and was sworn in as an attorney licensed to practice law on October 16, 1985. Mr. Contreras has continuously practiced law since that time. He is an experienced and skilled trial attorney who has tried literally hundreds of jury and bench trials throughout his busy career. Honors: Note Published in Spring, 1984 Oklahoma Law Review "Evidence: Admissibility of other Crimes to Establish a Common Scheme or Plan - Hall v. State"